The band was formed in 1923 from three smaller bands in the village and it was known as the Lydbrook Reed & Brass Band. Its first conductor was Mr. Maynard Childs. 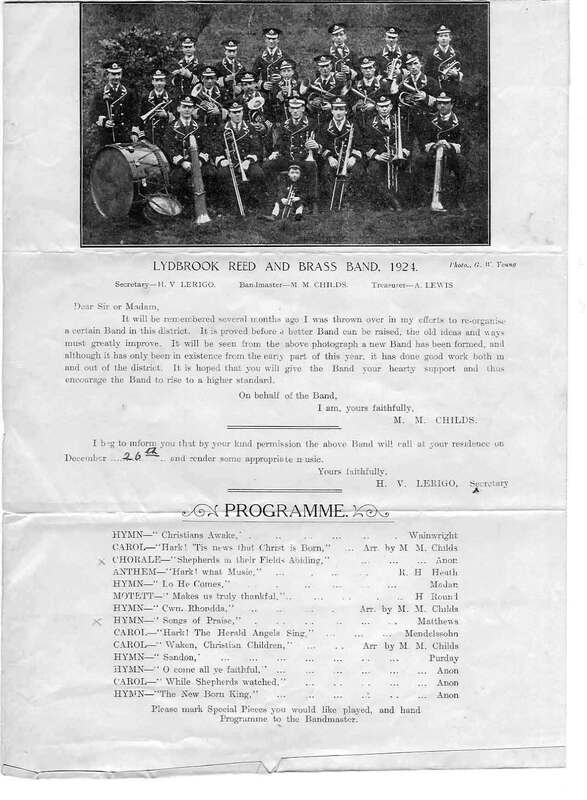 This is the first photograph of the band taken in 1924 with their Christmas programme. Mr. Maynard Childs was conductor for 12 years before being succeeded by Mr. Neville Barnett (a cornet player with the band) who held the post for over 30 years before ill health forced him to retire. Robert Morgan MBE took over from Neville Barnett in 1966 and conducted the band for 12 years before returning to the Principal Cornet seat when another local boy, Lyndon Baglin, returned to the area and became their Musical Director. Lyndon led the band from 1979 to 1988 which was a significant period in the bands history. With Lyndons dedication and leadership during that time the band progressed from the 3rd Section to the Championship Section. Brian Howard took over the baton in 1991, leading the band for a further 8 years. In 1994, with the band in the First Section, they achieved their greatest contest success when they took the runners up prize in the National Championships of Great Britain at Wembley Conference Centre. In 1999 Brian led the band on a tour of a lifetime, visiting South Africa and Zimbabwe and performing in Cape Town, Durban, Johannesburg, Victoria Falls and Harare. Since then the band has toured on a number of occasions visiting Holland, Hungary and Lithuania. Following Brians retirement in 2000 the band has engaged a number of different conductors for concerts and contests, including John Berryman, Philip Harper, Ian Holmes, Steve Sykes, David Williams and, from Norway, Tom Brevik. In 2010 Ian Holmes (Director of the University of the West of England Centre for Performing Arts) was appointed as the bands Musical Director. Ian has played Tuba with the Sun Life Band and is also an accomplished pianist. His teaching roles include Head of Brass at Clifton College and Director of Music at Colstons School in Bristol. Many players have come through the ranks at Lydbrook over the years and moved on to play in some of the countrys top bands. They include Lyndon Baglin (Euphonium), Brett Baker (Trombone) Bill Smith (Eb Tuba), Steve Smith (Euphonium), Robert Morgan (Cornet), Vaughan Davies (Cornet), Stewart Baglin (Euphonium/Tuba), Guy Garrett (Euphonium). Lydbrook Band must be unique in having only had three secretaries since its formation; Arthur Toomer (1923-1948), Archibald Price (1948-1978) and Robert Morgan (1979 onwards). Like many community bands Lydbrook has been fortunate to have some great fund raisers on their committee. The hard working non-players have raised many thousands of pounds for band funds over the years. This has enabled the band to build its own bandroom and buy new uniforms and instruments for the senior and training band.